study was to inveestigate the prolonged effect of an anabolic steroid (methandrostenolone) following cessation of drug administration and a 15 week detraining period. 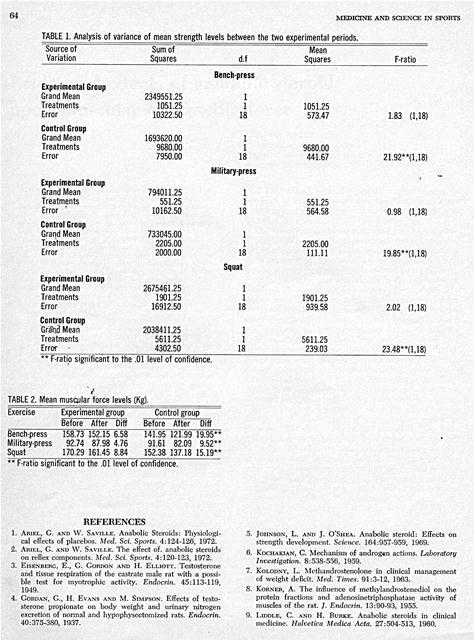 ing period which was then followed by a 15-week detraining period. a detraining period. Subjects who trained without the drug lost a significant amount of their muscular forces following the detraining period. Clinically, anabolic steroids have been used to relieve pathological conditions involving excessive nitrogen loss and reduced protein synthesis (7,9). Interest has been further increased through the use of these steroids at the opposite end of the spectrum, i.e., in an effort to increase body mass torfinhance physical performance. World-class power. event athletes are reported to be using anabolic steroids as complements to training regimens. Early work in this area has been hampered by the lack of research concerning the residual effect of anabolic steroids. Two recent studies (1,2) reveal the possibility of biochemical as well as psychological effects of anabolic steroids. 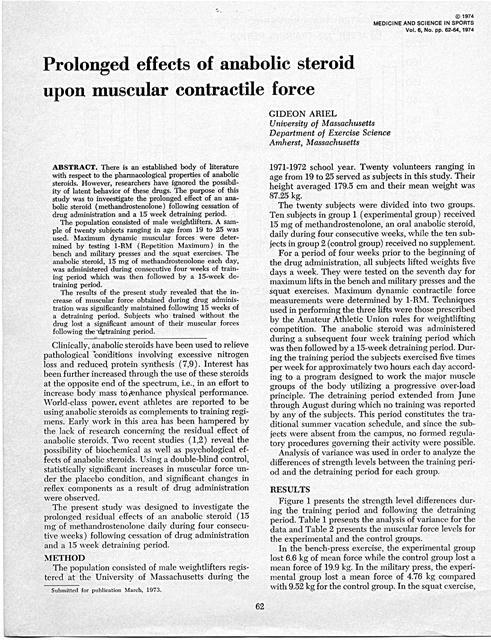 Using a double-blind control, statistically significant increases in muscular force under the placebo condition, and significant changes in reflex components as a result of drug administration were observed. The present study was designed to investigate the prolonged residual effects of an anabolic steroid (15 mg of methandrostenolone daily during four consecutive weeks) following cessation of drug administration and a 15 week detraining period. Submitted for publication March, 1973. 1971-1972 school year. Twenty volunteers ranging in age from 19 to 25 served as subjects in this study. Their height averaged 179.5 cm and their mean weight was 87.25 kg. The twenty subjects were divided into two groups. Ten subjects in group 1 (experimental group) received 15 mg of methandrostenolone, an oral anabolic steroid, daily during four consecutive weeks, while the ten subjects in group 2 (control group) received no supplement. For a period of four weeks prior to the beginning of the drug administration, all subjects lifted weights five days a week. They were tested on the seventh day for maximum lifts in the bench and military presses and the squat exercises. Maximum dynamic contractile force measurements were determined by 1-RM1. Techniques used in performing the three lifts were those prescribed by the Amateur Athletic Union rules for weightlifting competition. The anabolic steroid was administered during a subsequent four week training period which was then followed by a 15-week detraining period. During the training period the subjects exercised five times per week for approximately two hours each clay according to a program designed to work the major muscle groups of the body utilizing a progressive over-load principle. The detraining period extended from June through August during which no training was reported by any of the subjects. This period constitutes the traditional summer vacation schedule, and since the subjects were absent from the campus, no formed regulatory procedures governing their activity were possible. Analysis of variance v vas used in order to analyze the differences of strength levels between the training period and the detraining period for each group. Figure 1 presents the strength level differences during the training period and following the detraining period. 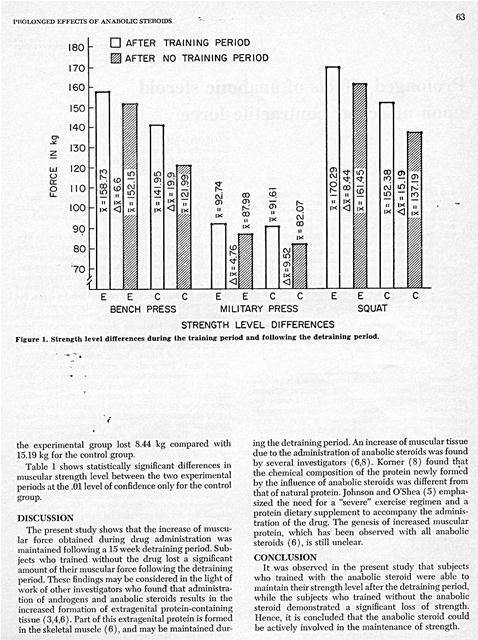 Table 1 presents the analysis of variance for the data and Table 2 presents the muscular force levels for the experimental and the control groups. Figure 1. Strength level differences during the training period and following the detraining period. the experimental group lost 8.44 kg compared with 15.19 kg for the control group. Table 1 shows statistically significant differences in muscular strength level between the two experimental periods at the.01 level of confidence only for the control group. ing the detraining period. An increase of muscular tissue due to the administration of anabolic steroids was found by several investigators (6,8). Korner (8) found that the chemical composition of the protein newly formed by the influence of anabolic steroids was different from that of natural protein. Johnson and O'Shea (5) emphasized the need for a "severe" exercise regimen and a protein dietary supplement to accompany the administration of the drug. The genesis of increased muscular protein, which has been observed with all anabolic steroids (6), is still unclear. It was observed in the present study that subjects who trained with the anabolic steroid were able to maintain their strength level after the detraining period, while the subjects who trained without the anabolic steroid demonstrated a significant loss of strength. hence, it is concluded that the anabolic steroid could be actively involved in the maintenance of strength. TABLE 1. Analysis of variance of mean strength levels between the two experimental periods. ** F-ratio significant to the .01 level of confidence. TABLE 2. Mean muscular force levels (Kg). on reflex components. Med. Sci. Sports. 4:120-123, 1972. 4. GORDAN, G., H. EVANS AND Ml. SIMPSON. Effects of testosterone propionate on body weight and urinary nitrogen excretion of normal and hypophyscctomized rats. Endocrin. 40:375-380, 1937. 5. JOHNSON, L. AND J. O'SHEA. Anabolic steroid: Effects on strength development. Science. 164:957-959, 1969.
of weight deficit. bled. T nies. 91:3-12, 1963. 8. KORNER, A. The influence of methylandrostenediol on the protein fractions and adenosinetriphosphatasc activity of muscles of the rat. J. Endocrin. 13:90-93, 1955. 9. LIDDLE, C. AND H. Bun . Anabolic steroids in clinical medicine. Halvetica 1fedica Acta. 27:504-513, 1960. Generated on 4/22/2019 1:00:57 PM (PST) ADI/HQ/GBA/2019/ARIELCLOUD/v3.0.2018.0126.